↑ "Edward R. Murrow". NCPedia. State Library of North Carolina. Retrieved 10 August 2016. ↑ Hattikudur, Mangesh (January 28, 2008). "What Richard Nixon and James Dean had in common". CNN.com. Retrieved 2008-01-31. ↑ "Edward R. Murrow, Broadcaster And Ex-Chief of U.S.I.A., Dies" (obituary). The New York Times. April 28, 1965. Retrieved August 10, 2016. 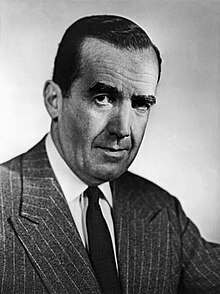 ↑ Edward R. Murrow and the Birth of Broadcast Journalism. Edwards, B. 2004. ↑ "George Foster Peabody Award Winners" (PDF). University of Georgia. Archived from the original (PDF) on 2011-07-26. Retrieved 2012-08-11. ↑ All duPont–Columbia Award Winners Archived August 14, 2012, at the Wayback Machine., Columbia Journalism School. Retrieved 2013-08-06. ↑ "Paul White Award". Radio Television Digital News Association. Retrieved 2014-05-27. ↑ "Edward R. Murrow". Greensboro Daily Photo. 2 April 2009. Retrieved 2012-08-11.